The last great Black Sabbath album, Sabbath Bloody Sabbath recovers from the relative mis-fire of Vol. 4, as the original members conjure up another four magical tracks to add to their already impressive repertoire. Sabbath Bloody Sabbath, A National Acrobat, Sabbra Cadabra, and Killing Yourself To Live may represent the most mature songwriting from the founding members of Black Sabbath. Now combining Tony Iommi's wizard riffs with more complex song structures, interesting variations, and more soulful, almost anguished vocal delivery from Ozzy Osbourne, Sabbath combine power with purpose to great effect on these four tracks. 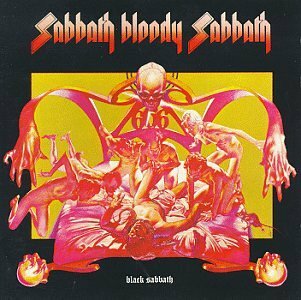 Sabbath Bloody Sabbath opens proceedings with a driving, prodding riff that gives way to acoustic variations, establishing the richness of the album. A National Acrobat rides on a take-no-prisoners, ground churning tank of a riff that moves at the speed of high density sludge and covers up the landscape with blackness. Sabbra Cadabra is lighter, faster, but no less impressive, Sabbath demonstrating a fleetness of foot and an ability to deliver a searching hook. The foursome ends with Killing Yourself To Live, a journey of the spirit that combines a slide guitar-inspired road trip with a riff that drops to the heavy bottom as Ozzy's vocals soar to the top, before taking a side-trip to the suburbs of psychedelia. The other four tracks on the album are similarly thoughtful, but generally more depressed and slower, lacking the necessary energy and creative spark. Who Are You?, Looking For Today and Spiral Architect unfortunately point to the direction that Black Sabbath would wander along on their next two albums, Sabotage and Technical Ecstasy. Half of Sabbath Bloody Sabbath is a glorious sign-off to the band's past; the other half points to a more troubled future. All Ace Black Heavy Metal CD Reviews are here.